According to recent reports, total consumer debt in the US has been rising in recent years, with total outstanding consumer debt totaling more than $4 trillion as of December 2018. This data comes to us via the Board of Governors of the Federal Reserve System. Now, why is this important? Well, in many ways, consumer debt is one of the engines that drives the American economy. As a result, market watchers and economists keep a close eye on this metric, as it could be a bellwether for positive or negative changes to come. But understanding consumer debt – and, importantly, the ways it differs from non-consumer debt – is also crucial for all of us. It’s not just academic – in many ways, it’s the very fabric of our lives, and it plays an important role in understanding our financial health as individuals. And crucially? Consumer debt can play a big role in discussions of Chapter 7 and Chapter 13 bankruptcy. The definition of consumer debt is broad, but important. Generally speaking, consumer debts are those debts that are incurred for primarily personal, family, or household purposes. Non-consumer debts, then, are everything else. An important category of non-consumer debt is business debt, which is non-consumer debt incurred with a profit motive. On paper, this distinction makes a lot of sense. Roughly speaking, consumer debts apply if you use money to cover a personal or household expense, or purchase goods that are going to be used primarily by your family. But in practice, it can get thornier to parse between consumer and non-consumer debts. For instance, let’s say you use your personal car to get to work – does that change the definition of your car loan, for bankruptcy purposes? Credit Card Debt: Generally speaking, using your credit card for personal daily expenses and household purchases counts as consumer debt. However, purchasing equipment or inventory for your business may qualify as non-consumer, and may need to be addressed as such. Tax Debt: Broadly speaking, tax debts generally qualify as non-consumer debts; this includes debts stemming from income taxes. Mortgages: Broadly speaking, a mortgage on your home counts as a consumer debt. However, a mortgage taken on a business property, or an investment property, will generally count as non-consumer debt. In other cases, a mortgage, refinancing, or home equity loan on a residence, used in order to fund a business, may well be classified as non-consumer debt. Car Loans: Context will matter a great deal here. If you use your family car to commute to work or make sales calls, it will still likely be classified as consumer debt, because of its primary use. However, if you take out a loan for a vehicle that you use exclusively for business purposes, this will likely count as non-consumer or business debt. Domestic Support Obligations: Broadly speaking, child support, alimony, and spousal support obligations typically qualify as consumer debt. Legal Fees: Generally, legal fees incurred from a family or household matter (i.e., divorce, child custody disputes, etc.) may qualify as consumer debts. Personal injury and tort debts are generally not consumer debts. Legal fees stemming from business disputes are generally considered to be non-consumer debts. In many cases, the fastest way to understand what types of debt you have may be to discuss your unique situation with an experienced local bankruptcy attorney, such as the team at the Gunderson Law Firm. No need to search for all the ever-changing variables and hope you don’t miss any key detail — just get in touch, and we can help furnish the information you need, with straightforward answers tailored to your personal circumstances. 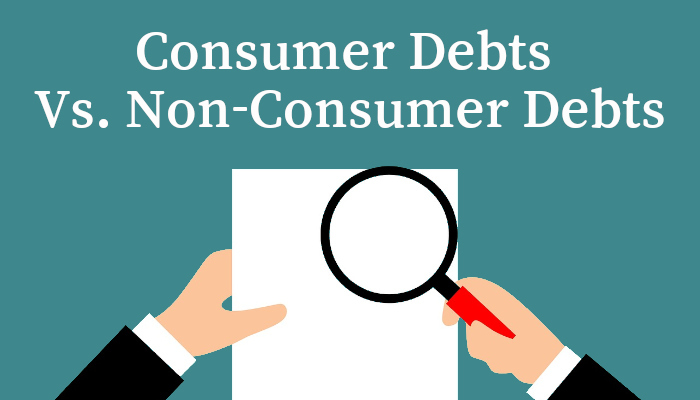 Understanding the difference between your consumer and non-consumer debts is a crucial part of the bankruptcy process, whether you’re pursuing Chapter 7 or Chapter 13. For one thing, many filers are required to take a means test to determine if they are eligible to file for Chapter 7 bankruptcy, based on their income and debts. However, you are not generally required to take the means test if more than half of your debts are non-consumer in nature. In other words, debtors whose debts are primarily business debts and other types of non-consumer debts are not required to take the means test in order to initially qualify for Chapter 7. This distinction also plays a role in Chapter 13 cases. You see, in Chapter 13 bankruptcies, codebtors on a consumer debt are protected by the terms of the automatic stay during bankruptcy. However, non-consumer debts are not protected under Chapter 13. In other words, in Chapter 13, there is no cosigner or codebtor automatic stay protection when it comes to business or non-consumer debts. Any More Questions About Bankruptcy? Keep in mind that we’ve only looked at the broad strokes in this article. In practice, everyone’s situation will be quite different – and, often, it may prove essential to consult with a professional in order to determine what will truly be the best course of action for your unique circumstances. When it comes to determining the right course of action for you, there are any number of factors that need to be considered – from Illinois median incomes, to allowable expenses, to the amount of secured vs. unsecured debts you have, to the mathematical formulas used for means testing, and so much more. In short? It’s a lot to tackle alone. If you have any more questions or are looking for guidance on bankruptcy in the Chicagoland area, the Gunderson Law Firm can help can get you actual, straightforward answers you’re looking for. Don’t hesitate to drop us a line with any questions, or to set up your free initial consultation. At the Gunderson Law Firm, our experienced bankruptcy team will take every step possible to protect you and your assets immediately, and throughout the bankruptcy process. Down the line, we can also counsel you on realistic ways to avoid such serious debt issues in the future. Whether you are a business owner, a wage earner, retired, or otherwise, we can address your specific situation with strategic plans to help put severe indebtedness behind you, so you can enjoy life again.